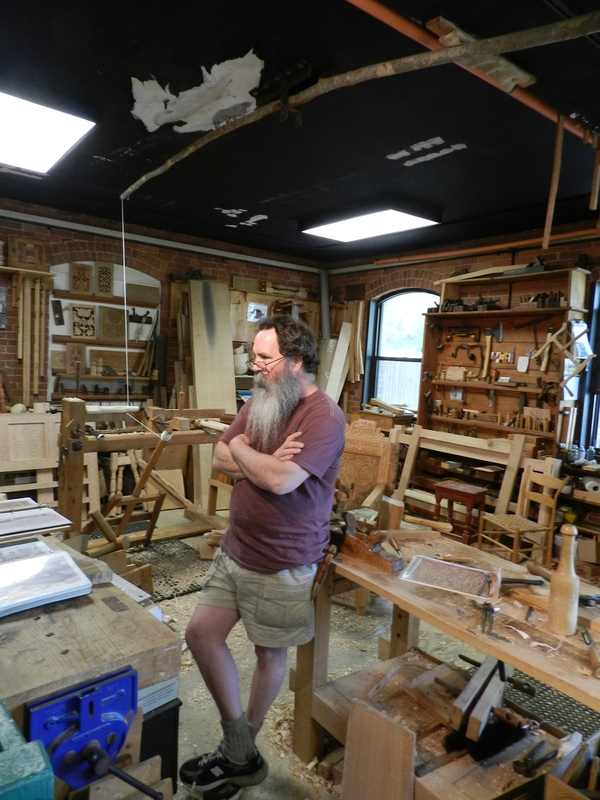 For me, one of the highlight’s of this years EAIA conference was a lecture from and later talking with Peter Follansbee of Plimoth Plantation. I met Peter before as some of my classmates from NBSS have worked at the plantation, but on this visit, it was particularly interesting to learn more about what brought him to the plantation and how his work and research have changed over the years. 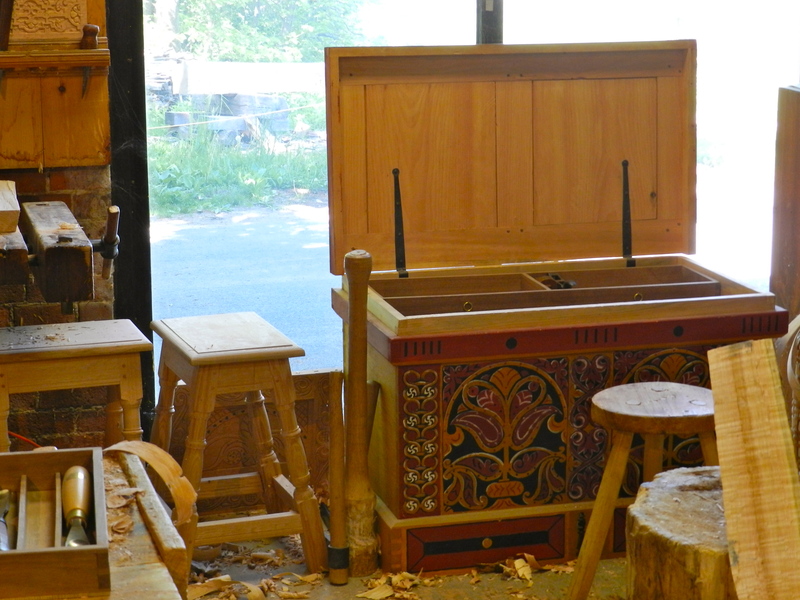 Peter answered many questions and demonstrated some carving at the bench. In person I find he often has funny anecdotes and snarky comments that are both cutting and entertaining. Shavings from the early part of a day’s work — the way a shop should look. 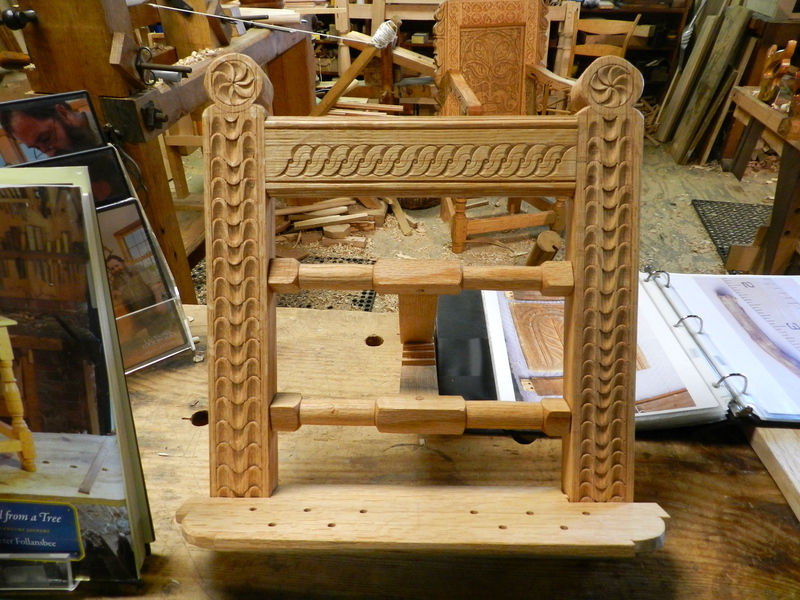 I particularly liked the carved book stand (seen below) which could be adjusted for viewing angle, and had small dowels that can keep the book open. 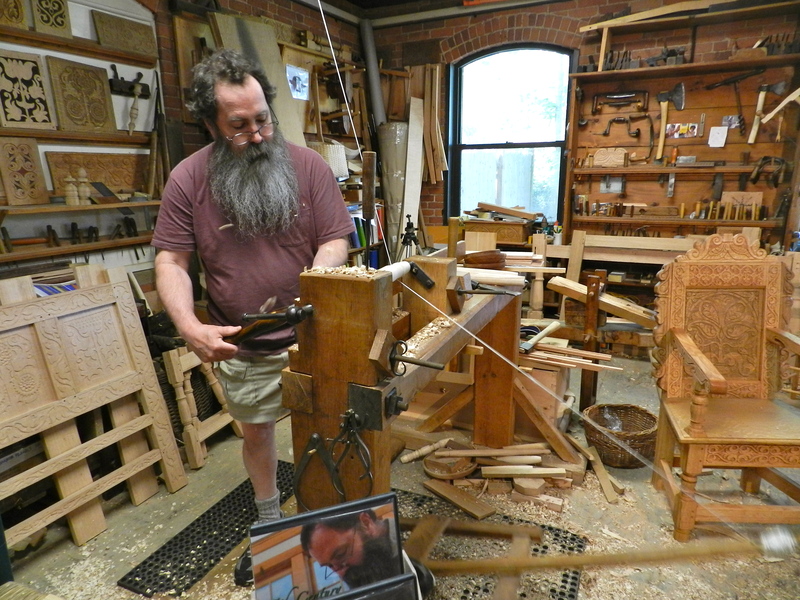 He also demonstrated some light spindle turning at his pole lathe. 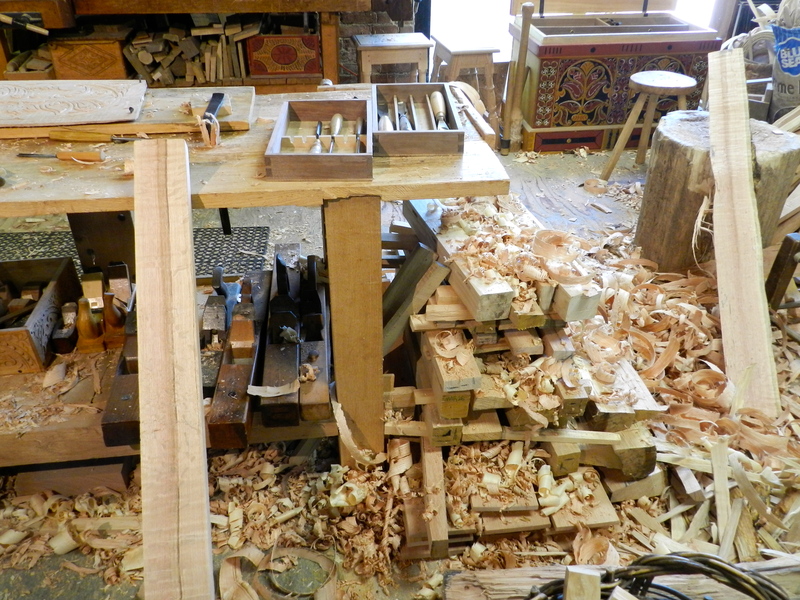 In the shop, as always, were examples of the varied sorts of work he carries out. 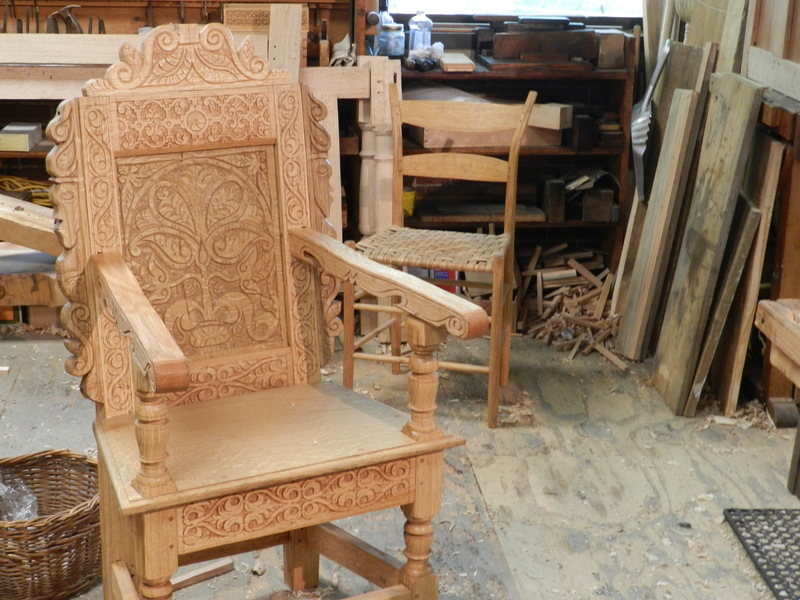 Seen below is a great looking carved English style chair, and behind is a greenwood chair similar to that which is seen in Jennie (John) Alexander Jr’s book on working with green wood which I heard was the inspiration for Peter’s recent book on making joint stool from a tree. Beautiful carved chair. 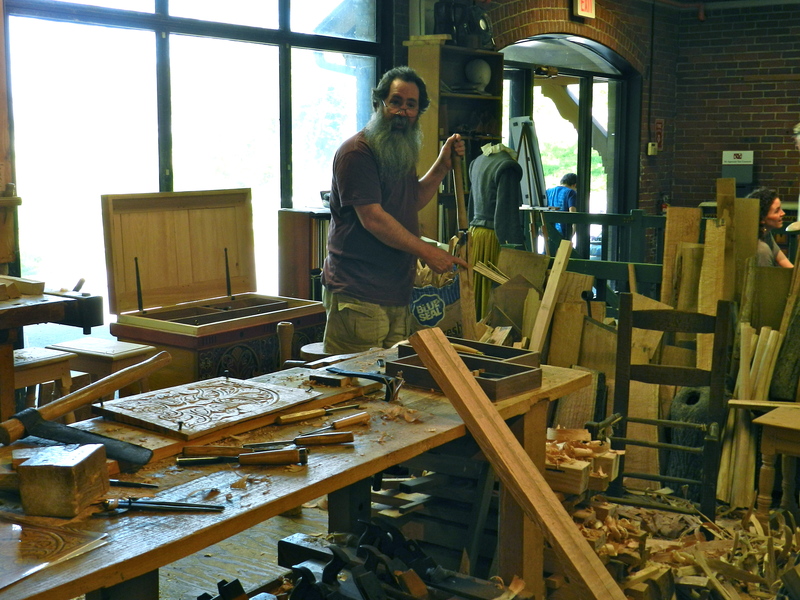 In the background a chair built to the specs from ‘Make A Chair From A Tree : An Introduction To Working Green Wood’ which was the inspiration for Peter’s ‘Make a joint stool from a tree’ book. Peter was gracious enough to sign my DVD of his carving, so that also made my day. Surrounded by a throng of overly eager visitors, Peter took question and demonstrated the use of a froe for splitting wood. Above you can see some joint stools from his book on that subject along with his own interpretation of the Anarchist’s tool chest based on the recent book by Chris Schwarz. 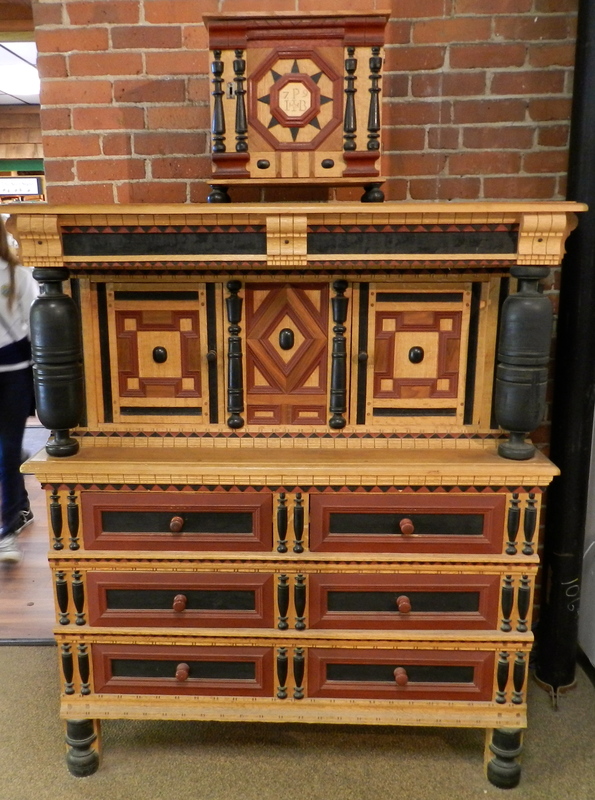 It was neat to see how Peter used (presumably) blacksmith made hinges and painted the chest. (Along with a different panel configuration for the lid). You can learn more about it on Peter’s blog here. A sample of the high style work Peter produces. Similar to a piece he has at the MFA next to a partial original. It’s amazing to see how much brighter the colors were originally. And finally, shown here is an example of some of the high style work Peter produces. When I give my class a tour of the MFA America’s wing each summer I am always happy to show them the original they have on display alongside the reproduction Peter produced for the museum to show how the piece likely looked when it was new. I always find it interesting to see how earlier generations enjoyed color, and changing styles much as folks do today. It was another great visit to Peter’s shop, and I look forward to seeing what he’s been up to on my next visit to the plantation.